In 2008, Kathy Noble set out to turn 10 acres of noxious weeds and grass in the Bellevue Triangle into a beautiful organic farm with windbreaks, fruit trees, blooming shrubs, vegetables, greenhouses, chickens, piggies and a menagerie of rescued cats and dogs to keep everyone in line. From the onset, making topsoil has been her primary concern, and she has succeeded in creating a half an acre two feet deep. A professional landscape architect, Kathy serves on the board of the Blaine County Soil Conservation District. When she isn’t busy caring for her animals and land, Kathy works tirelessly to improve our local/regional food system. 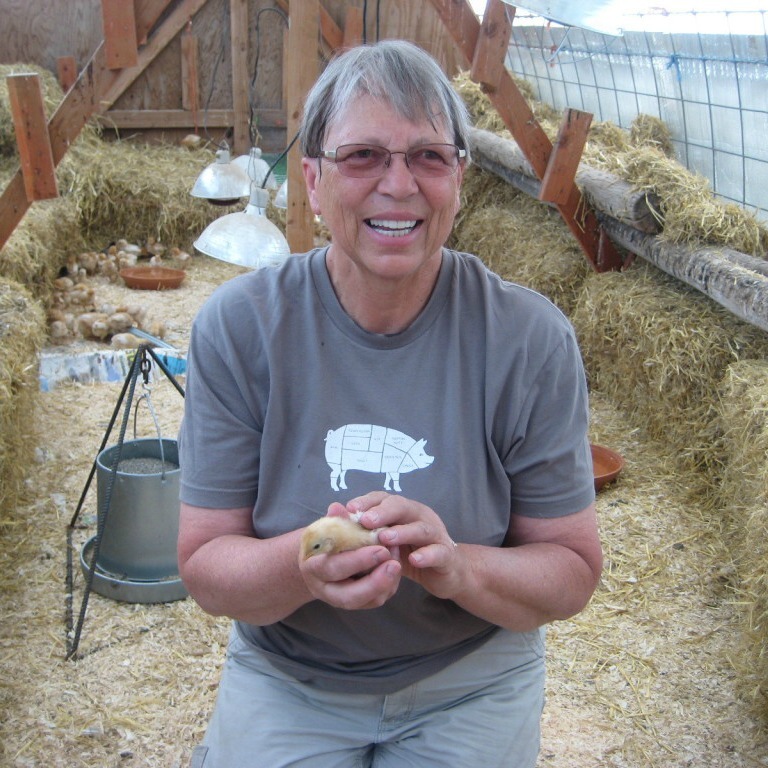 Her recent efforts include working with regional poultry farmers to develop a state-licensed poultry processing facility and co-founding the Idaho Food & Farm Guild, which strives to make it easier for school districts to buy from local farmers. Where you can find them: Look for her Noble Eggs in the bright pink containers at Village Market, NourishMe, Atkinsons’ Market in Hailey, Bellevue General Store, Vertu Beauty Salon, and through Idaho’s Bounty. Her eggs are used in Simple Kneads bakery products and menu items at the Power House in Hailey. Her pork is served by KB’s Burrito’s, and is sold by the half or whole to individuals by contacting Kathy directly. When I was 4 years old, we moved half a mile down a gravel road from my grandparents who had a farm and I could just run down to their house and help with whatever they were doing at the moment: milking cows, weeding the garden, harvesting apples, canning fruit or making jam, skinning and gutting a steer, making hay, preparing vegetables and meat for stew, making angel food cake, yum! Catching fish or crawdads, feeding the wild birds, harvesting honey form the bee hives, planting flowers… there were endless things to do at grandma and grandpa’s house. What’s your definition of good food? Good food is fresh from your own garden or local farm, and well prepared, which for me often means raw. I prefer most vegetables and fruits raw. Recently, I went to an Idaho’s Bounty meeting and one of the ladies had baked whole-wheat dinner rolls from freshly ground flour. They were so full of flavor! When was the last time you chose to eat a dinner roll? They are usually white goo! It’s been decades since I have eaten one like my grandmother and I used to bake. Who is you food hero? My grandmother. Growing up, I helped her churn butter, bake bread from scratch, make pie crust from scratch, weed the vegetable garden, gather eggs, chop off chicken heads, dry filberts, pick raspberries, sew quilts, pluck geese to make feather pillows, and many other farming chores. I loved helping my grandmother. I would like to be able to drive around America and go into small-town local cafes and get wonderful, from-scratch cooking again. I hate driving long distances anymore. A person could starve to death trying to find anything edible! I also would like for Americans to come to the realization that small- and medium-sized family farms produce the best, healthiest food, and that the most important thing any of us can do for our health is to eat fresh unprocessed food. This is a hard question because I used to love to bake bread but I don’t spend enough time in my kitchen to do that anymore. When I was studying landscape architecture, I took a study abroad section in Italy. We lived in a villa with a vineyard about seven miles from town. Local Italian ladies would come cook the evening meals for us. We had a garden at the villa which we would harvest vegetables from and the ladies would make the most fabulous red and white sauces, which would include what ever veggies we would bring from the garden. I learned that pasta sauces are to the Italians, what stews are to Americans. They are simply made up of whatever you have available to throw in the pot. They would put in carrots and zucchinis, and eggplant and potatoes and corn, celery, and cauliflower with their fresh tomatoes. They would cook it all up and we would devour it because it was simply scrumptious! Pasta sauces are great because you can do them in a crock-pot and you don’t have to be in the kitchen all day in order to eat well at night. I would like our culture to value and embrace “from scratch” cooking again and to appreciate the hard work, time, knowledge, and love that goes into producing the ingredients, as well as the artistic talents of the chefs who prepare what appears on your plate. I would like the people in our community to re-awaken to the wonderful flavors of the heritage varieties of vegetables and grass fed meats. These varieties and breeds of animals have not only more flavor, and significantly more nutrition, but the methods used to produce them are more environmentally friendly. I would like our kids to grow up with some basic knowledge of growing food, knowing the wonderful flavors of fresh, healthy, unprocessed foods without the chemicals none of us can pronounce.